BEAUTIFUL BURTON SCHOOL DESIGNED BY HENRY H. TURNER WITH A NEW MODERN ADDITION THAT IS COMPLEMENTARY TO THE OLD BUILDING. In all areas of the urban core, you will find the beautiful historic style schools of Henry H. Turner. Turner was responsible for an unprecedented wave of school construction in Grand Rapids. Some of the Grand Rapids Schools designed by Turner include, Fountain School, Lafayette School, Stocking School, Congress School, Lexington School, and Burton School. Turner's influence extended beyond as well. He designed Breton School in East Grand Rapids on Boston at Breton, in the area known then as Paris Township, and he designed schools in Kalamazoo and Muskegon as well. STOCKING SCHOOL, 2017. CURRENTLY IN USE. Henry Turner was born in 1881 in Auburn, New York to a Swedish father turned English sea captain and to a German mother who died when he was age seven. Turner grew up in Brooklyn with his uncle, a well-known minister who was known to look like a twin of Theodore Roosevelt, and who expected Henry to follow in his ministerial footsteps. Henry had already at a young age determined he would be a minister, and without his uncle's support, had to strike out on his own for his education. After completing his training at Harvard in 1907, Turner worked for a year with the progressive St. Louis school architect, William B. Ittner, and then moved to Cleveland to work with another school architect F.B. Barnum. 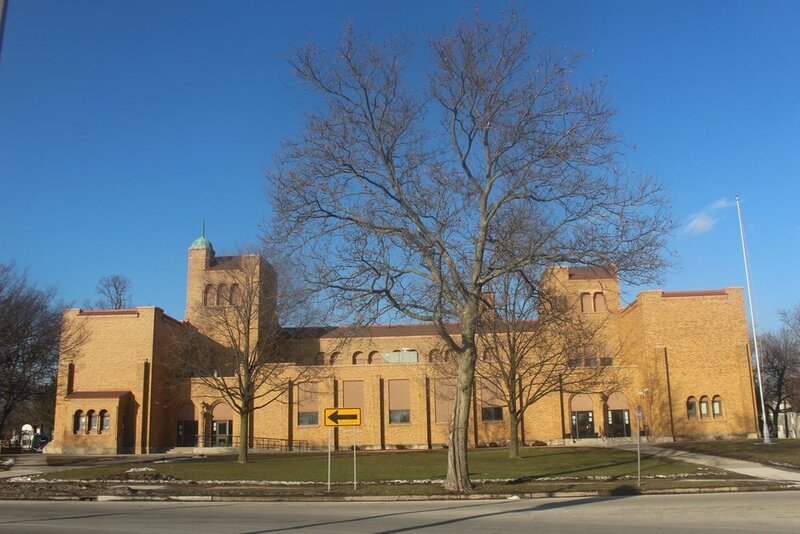 He was recruited in 1909 to become the Grand Rapids Schools Architect and thus began a wave of classically styled school buildings he designed through the 1920's, even after he went into his own practice in 1919 with architect Victor Thebaud and engineer W. W. Bradfield. ORIGINAL ARCH IS ALL THAT REMAINS OF THE OLD MODIFIED GOTHIC STYLE . DICKINSON SCHOOL WAS REPLACED BY A NEW BUILDING. The fact that so many of the schools of Henry H. Turner (who by the way, added the H. as a middle initial himself to distinguish himself from a school mate with the same name) have survived and are vital in the community today speaks to the solid and pleasing design of these buildings of Henry H. Turner, AIA. AIA Historical Directory of American Architects,: A Resource Guide to Information about past architects. “Who’s Who in Grand Rapids—XXI. Henry H.. Turner,” Grand Rapids Spectator, August 11, 1928. “School Architect Turner Resigns Job,” Grand Rapids Herald, Sunday Morning, October 12, 1919.